It wasn’t all knitting while I was away – I decided that rather than risk getting my knitting needles confiscated on the plane, I would use the coach journey to the airport, and the (very short) flight to have a go a crocheting some granny squares. 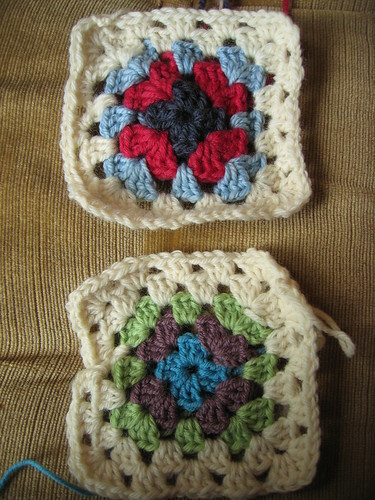 Oh creased and wonky granny squares I think I love you. It’s going to be very much a background project, but given that most of the things I’m planning to knit from now till Christmas are prodominately small-small or small person sized, or toys/fruit/veg of some sort (and oh how my knitting will all-but grind to a halt when no.2 arrives in October 🙂 a background project will be very welcome I’m sure. Plus – stash buster! (Though so will the toys/fruit/veg). PLUS – I get to play with colour! I too am loving the crochet at the moment – my picnic blanket is getting increasingly bigger as one giant granny square and I have found it very soothing. I pick it up when I can’t face anything more taxing or like at the moment not sure what to start/finish next 😉 I also cannot wait to see the toys/fruit/veg plans as you know those things are very close to my heart! Also I’m totally in love with the idea of a tote bag made up of granny squares.